There has been a lot of talk lately about the number of productions women playwrights receive, versus our male counterparts. The numbers fall out at about 20% plays by women to 80% plays by men. It's a complex problem. Perhaps you've read something about it from the 50/50 in 2020 folks, or from the Los Angeles Female Playwrights Initiative, or by reading Todd London and Ben Pesner's book "Outrageous Fortune." What I'd like to talk with you about today is a theater company in Chicago that is taking action, producing five world premieres of brand new plays by women playwrights in June and July, 2011. Halcyon Theater's Alcyone Festival is one of the boldest correctives to the dearth of productions of women's work I've heard about, and I am absolutely delighted to be one of the lucky participating playwrights. Halcyon is run by Artistic Director Tony Adams and his wife, Associate Artistic Director Jenn Adams. This is their fifth season of production. I met Tony and Jenn two years ago, when they produced my play "Heads" in Alcyone 2009. I remember being shocked to see their call for plays; the theme that year was Women Writing about Terrorism. And I was! I had. I flew out to Chicago to see the festival, and was tremendously impressed with the scope of Halcyon's vision. They produced six plays in that year's festival, by playwrights from around the world. Beautiful, bold plays. By women playwrights. It was exciting and it was exhilerating and it was PRODUCTIONS. I've kept in touch with my Halcyon friends since then, but was surprised and delighted when they contacted me, and asked if I wanted to take part in this year's Alcyone Festival. They were doing something different -- asking five of us, with whom they had worked in previous years, to rework, adapt, sample or remix the work of a woman playwright from 1850 or before. They couldn't afford to make it a commission -- but they would commit to producing what we wrote. I said YES. ABSOLUTELY! YES!! And so did J. Nicole Brooks, Jennifer Fawcett, Coya Paz and Caridad Svich. Wrestling with the work of Hrosvitha, Pauline Hopkins, Charlotte Mary Sanford Barnes, Anna Cora Mowatt and Maria de Zaya y Sotomayor, respectively. If you haven't heard of any of them... well, that's part of the point. We are retrieving the female playwriting canon. We are speaking with our sisters across time and space. We are standing together to tell strong new stories for the stage. It's a festival of our own. I can't wait to get to Chicago and see what my fellow playwrights have come up with, and see my own play come to life on Halcyon's stage. This has already been such a rich and rewarding challenge, just in the writing! I'm hoping that you'll join me. 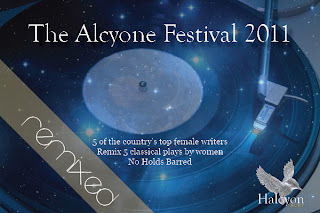 I'd like to invite you to take part in this year's Alcyone Festival. How? If you're in Chicago, please come and see the festival! Tickets are available here. If you produce plays, and are curious about our adventures in adaptation, ask us for a copy of our work. I'm sure all of us playwrights would be glad to talk with you about future productions of these plays that started at the Alcyone Festival. E-mail Tony for our contact information, or feel free to contact us directly. If you want to help Halcyon Theater to produce work by women playwrights, click here to make a donation. Every cent will go to making this festival happen -- and letting women's voices be heard. You have the power to tip the scale. YOU can make a difference. Thank you for reading! And I hope to see you in Chicago! A short lecture (with chalkboard scribblings!) about the shape of stories by Kurt Vonnegut can be found HERE. I found it to be fantastic. Check it out! The last couple months have allowed me two opportunities to support young playwrights in the making, one on each coast. So! Given the opportunity to give back is a wonderful thing. Last month, I spent a day with the wonderful folks at Passage Theater from Trenton, NJ and a great group of kids from Emily Fisher Charter School. Passage's "The State Street Project" employs the "playmaking" model created by the 52nd Street Project in New York. One on one mentoring results in a ten-minute play written by each and every kid. This batch of plays are going up at Passage Theater on June 4-5, 2011. Check 'em out! This is the third year I've participated in the Young Playwrights Festival, produced by the Blank Theater in Hollywood, CA -- but it's the nineteenth year that they've done it! I love the Blank -- they've done readings of a bunch of my plays in their Living Room Series, and produced the world premiere of my play Heads. Each of the twelve winning playwrights are assigned a mentor, who helps them through one rewrite/touch-up of their plays before they go up in full, star-studded productions that run throughout the month of June. The plays are great fun -- and you get a chance to encourage some really talented young writers. Go see it! A Little Article about Agents in "The Dramatist"
The March/April 2011 issue of "The Dramatist" -- the Journal of the Dramatist Guild of America -- is all about agents. "The Agents Issue" is an appropriate moniker, as the question of whether or not you need an agent to be a successful playwright in today's world is one that comes up regularly. 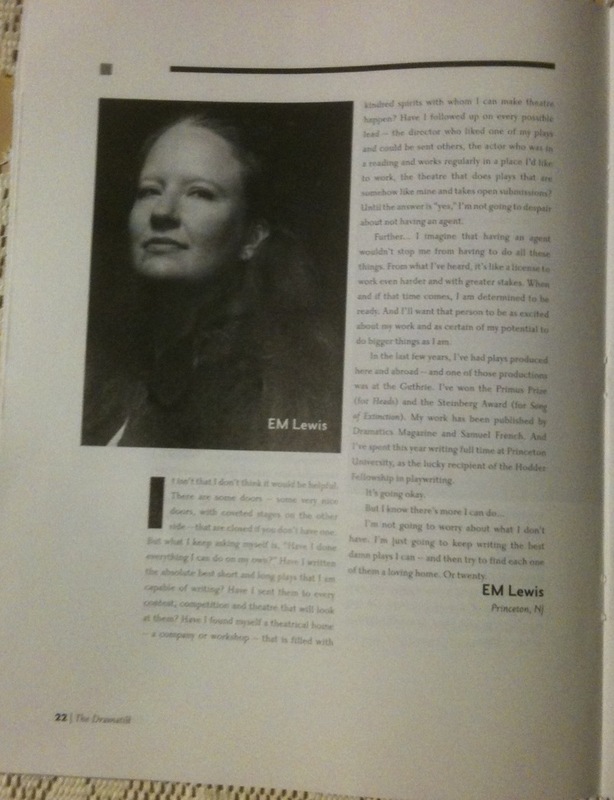 From "Agent Free" in the Mar/Apr 2011 issue of The Dramatist. Writing from the "Agent Free" perspective, dramatists who are "surviving, even thriving without an agent." "Starting Out" offers "personal tales from established dramatists about how they first signed with an agent... or came close to."